LULING, Texas – (Sept. 26, 2012) – A Caldwell County institution was officially replaced Friday. Fortunately, it was replaced by a new and improved version of itself. For years, Ascension Seton Edgar B. Davis Hospital in Luling has operated the Children’s Care-a-Van, a mobile home-size doctor’s office on wheels that travels regularly to Caldwell County schools and churches and provides affordable health care to low-income children up to age 18 who otherwise do not get medical services. A new Children’s Care-a-Van, purchased by hundreds of local donors and with a grant from the Michael and Susan Dell Foundation, was unveiled “under the oaks” at the hospital. Many donors will be there this morning when the new vehicle was revealed for the first time. The new vehicle is nearly 39 feet long, weighs 15 tons and has a six-speed automatic transmission, 340 horsepower engine, 80 gallon diesel fuel tank and a wheelchair lift. Inside are two exam rooms for young patients. In addition to immunizations, the Care-a-Van offers treatment for minor illness and injury; well child exams; school and sports physicals; management of chronic ailments such as asthma and obesity; and pharmacy and screening for health care funding sources, including CHIP. While some Care-a-Van patients have at least some health insurance to cover costs, no child is ever turned away due to a family’s inability to pay. 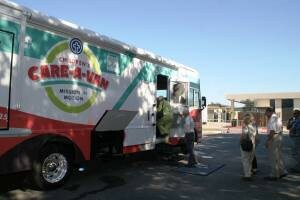 In 2011, exactly 1,436 children were provided immunizations by the Children’s Care-a-Van. About 1,500 children were examined during acute and primary medical care visits – and about half of them had no means to pay, she said. 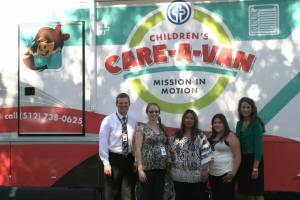 “Among our patients last year, 60 percent used the van as a primary care provider. That means they didn’t go an emergency room, saving hundreds of dollars in ER visits,” Carter said. Money for the Care-a-Van is raised during the annual “Taking Care of Tiny Texans” Gala that has grown so large, no building in Caldwell County can accommodate it. Presented by the Caldwell County Associates of the Ascension Seton Hospital Development Board, the 8th annual gala was held Aug. 11 at the Embassy Suites convention center in San Marcos. “Caldwell County may not be rich financially, but so many residents are generous and genuinely care about all the children in our community. This new Care-a-Van wouldn’t be here without them, and I can’t thank them enough for their continuous support,” said Sandra Hendricks, director of development for the hospital and gala organizer.